Summary. Aim: Study is devoted to evaluation of sensitivity of peripheral blood T-lymphocytes (PBL) of patients with endometrial cancer (EC) to genotoxic effect of bleomycin and detection of patients with hidden chromosomal instability. Methods: PBL of 24 EC patients (mean age 58.9 ± 2.9) and 10 healthy women-volunteers (mean age 55.7 ± 2.3) were subjected to cytogenetic analysis. Results: Mean spontaneous level of chromosomal aberrations (CA) per 100 analyzed lymphocytes (CA/100) of healthy women has equaled 2.7 ± 0.6, i.e. has not exceeded maximal values of healthy population and was significantly lower (p < 0.05), than in PBL of EC patients (6.9 ± 0.6). After incubation of PBL with bleomycin, number of CA/100 significantly was increased both in control (11.5 ± 1.3) and in EC patients (21.9 ± 1.0). Spontaneous chromosomal instability has been observed in 41.7%, increased sensitivity to bleomycin — in 54.2% and hidden chromosomal instability in 37.5% of patients with EC. It has been shown that level of specific damage of genome in EC patients has constituted 2·10–5, and after exposure with bleomycin, it was increased 4.5 times (9·10–5) that was significantly higher (p < 0.05) compared to control (8·10–6 and 1.0·10–5, respectively). Conclusion: These results have demonstrated that PBL of most patients with EC are characterized by apparent genome alterations, which are manifested by increased number of spontaneous and induced chromosomal damages, hypersensitivity to mutagens and hidden chromosomal instability. Abbreviations used: CA — chromosomal aberrations; EC — endometrial cancer; PBL — peripheral blood T-lymphocytes. Searching for genetic markers, which would allow detecting individuals with predisposition to cancer and identifying tumor in its initial stages, is urgent task of modern oncology. Number of reports showed changes of immune status in cancer patients, inclu­ding decrease of T-lymphocytes activity due to inhibi­ting effect of tumor and genetic defects of components of immune system . Chromosomal instability in peripheral blood lymphocytes (PBL) is the evidence of disorder in genome and, first of all, imperfection of functioning of DNA reparation genes. It is typical for many solid tumors, including endometrial cancer (EC), development of which is connected with mutations or epigenetically caused changes of genes, which are responsible for reparation of unpaired bases of DNA — genes of MMR family and genes-regulators of cell cycle: PTEN, PIK3, KRAS, BRAF, etc. . According to the results of our previous studies, increase of mean spontaneous level of chromosomal aberrations (CA) in PBL of patients with EC compared with healthy women is observed . However, analysis of individual parameters has determined patients with low frequency of cells with CA, which have not exce­eded maximal values of healthy population (3.0%) ­[­4–6]. If we hold the view that individuals with hidden chromosomal instability exist [7, 8], than we can assume that patients with EC are divided into two groups — with existing and hidden chromosomal instability, which probably plays certain role in pathogenesis of disease. Increased number of spontaneous damages of chromosomes in PBL, hypersensiti­vity to the impact of mutagenic factors and hidden chromosomal instability are signs of destabilization of genome [3, 7–9], study of which becomes more urgent for detection of individuals susceptible to development of malignant tumors, formation of groups of genetic risk of cancer pathology and further monitoring of woman health. For imitation of impact of hazardous factors on cell genome, various mutagens are used, among which most widespread and offered for use in such studies (in many countries of the world, including Ukraine) is bleomycin [8, 10, 11]. Mechanism of bleomycin effect is similar to the effect of many mutagens of physical and chemical nature (for example, ioni­zing radiation or hydrogen peroxide) and is connected with occurrence of oxidative stress, in consequence of which active oxygen forms cause occurrence of single and double strand breaks of DNA. The highest activity is performed by bleomycin, when it impacts cells being in phase G2 of mitotic cycle [8, 10–12]. We designed this study to evaluate the sensitivity of EC patients’ PBL to genotoxic effect of bleomycin and detect the patients with hidden chromosome instability. PBL were studied from 24 patients with EC in age from 48 to 67 (mean age 58.9 ± 2.9), which underwent the treatment at the department of Oncogynecology at the National Cancer Institute of Ministry of Health of Ukraine (The head of the Department — M.D., Prof. L.I. Vorobyova). Blood from vein was received from patients before surgical treatment and chemotherapy. 10 healthy women-volunteers in the age from 23 to 64 (mean age 55.7 ± 2.3) were included in control group. All patients have given informed consent for blood sampling, cytogenetic studies and use of the results for research goals. To study the spontaneous level of CA in PBL of patients, whole heparinized venous blood (1.0 ml) has been cultivated during 52 hrs, according to the recommendations  with some modifications. For evaluation of sensitivity of chromosomes to the impact of mutagen, PBL of patients with EC and healthy women have been cultivated during 72 h with adding of bleomycin hydrochloride solution on 48 hour of cultivation in final concentration 5 µg/ml [8, 11]. Fixing of specimens and receiving of metaphase chromosomes has been carried out by standard method. Staining of specimens has been performed by Giemsa-trypsin method . Cytogenetic analysis of PBL has been carried out on codified specimens of chromosomes using of light microscope at magnification x1250 (oil immersion). Number of analyzed metaphases varied from 50 to 200 in each observation. At cytogenetic analysis, number of metaphases with CA, number of CA per 100 metaphases (CA/100) and per 1 aberrant metaphase were calculated. Also types of CA — chromatid and chromosome bre­akage were characterized: single acentric fragments and chromatid-chromatid exchanges, paired acentric fragments, dicentrics, rings, marker chromosomes, breaks of chromosomes by centromere. Separately localization of aberrations on chromosome has been determined. Moreover, for taking into account the number of CA, which were determined in particular chromosomes in different groups of karyotype, specific damageability of particular chromosomes (number of points of damage on group of examined chromosomes) and specific damageability of genome damage, have been calculated: (Wі-chromosome) and (Wgenome) . where ni — number of damages in concrete chromosome in і-patient; Ni — number of analyzed metaphase plates in і-patient; L — relative length of chromosome ; I — number of patients. By level of chromosome damage, conclusions concerning spontaneous and induced instability of genome and hypersensitivity of chromosomes to the effect of mutagen have been made, calculating index mentioned below . where Mici — individual values of frequency of CA under the effect of bleomycin; M — mean group values of CA under the effect of bleomycin. Hypersensitive to bleomycin at that were considered all patients with Iici higher, than 1.0 (independently from Isci). Patients with Isci lower than 1.0, and Iici — higher than 1.0 — were considered to have hidden chromosome instability in PBL. Statistical analysis of results has been carried out using Statistica 6.0 (StatSoft, Inc.) with use of nonparametric criterion of Wilkinson — Mann — Whitney. Significant were considered diffe­rences at р < 0.05. Spontaneous level of CA/100 in control varied from 1.0 to 4.0 and equaled at the mean to 2.7 ± 0.6, i.e. has not exceeded mean values in healthy population (Table 1). Note: *difference between indexes in patients with EC and in control is significant (р < 0.05); ^difference between indexes of spontaneous and induced levels of CA is significant (р < 0.05). In contrast, in PBL of EC patients, spontaneous level of CA/100 was significantly (р < 0.05) higher, than in healthy population and in control, and has constituted 6.9 ± 0.6. In all studied specimens, aberrations of chromatid type prevailed and mostly were represented by single acentric fragments of chromosomes. It should be mentioned that individual values of spontaneous frequency of CA/100 in PBL of patients with EC varied in wider range (from 2.0–26.0). At that Isci in metaphases of EC patients varied from 0.3 to 3.8 and in 41.7% of patients was higher, than 1.0 that is the evidence of presence of spontaneous chromosome instability in these patients. At the same time, Isci in control was mostly lower, than 1.0 and only in one patient it has constituted 1.5. Undoubtedly important criterion for determination of cytogenetic changes in cells is evaluation of PBL sensitivity to mutagenic impact of alkylating substances, in particular, bleomycin. After incubation of PBL cultures with bleomycin, frequency of aberrant cells and number of CA/100 reliably (р < 0.05) increased both in healthy women and in EC patients. In patients with EC, higher number of CA/100 (21.9 ± 1.0, at individual variations from 17.0 to 44.0), than in healthy women (11.5 ± 1.3, at individual variations 7.0–19.0) was observed. At the same time, in PBL of healthy women, number of chromatid aberrations has decreased and number of aberrations associated with damage of chromosomes has increased. In PBL of patients with EC, after incubation with bleomycin, these indexes have almost not changed (see Table 1). According to the data of literature [8, 10], bleomycin is a substance, which, the same as ionizing irradiation, causes occurrence of aberrations of chromosome type, but presence in analyzed cultures of high percentage of chromatid aberrations can be the evidence of its action as both radiomimetic and chemical mutagen. Besides mentioned above, according to the recent studies, presence in PBL of certain quantity of CA of chromatid and chromosome types depends not only on parameters of active substance, but mostly on polymorphism of series of genes of excisional reparation of DNA bases . In particular, authors showed that in group of studied children, who lived in the conditions of chronic impact of radon, higher level of aberrations of chromatid type in carriers of genotype АРЕ 148Glu/Glu (4.58 ± 0.41; p = 0.045), than in individuals with genotype APE1 Asp/Asp (3.67 ± 0.33) has been determined. In the same study, decrease of total frequency of CA in carriers of heterozygote XRCC1 280 Arg/His of genotype (4.55 ± 0.57; p = 0.04) compared with Arg/Arg genotype (5.59 ± 0.22) has been determined. In our opinion, detected high level of spontaneous and hidden chromosomal instability in patients with EC is also result of disorder of functioning of systems of DNA reparation that can be one of the reasons of development in these patients of cancer disease. This assumption can be confirmed by the study of effectiveness of DNA reparation (method of ge­l-e­lectrophoresis of isolated cells), which has been previously performed by us in this group of patients. It has been determined that after processes of reparation in PBL of EC patients, 63.9 ± 20.9% of DNA damages (in control — 80.2 ± 3.0%) have been repaired . 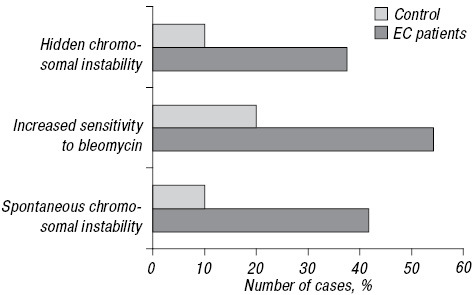 Analysis of PBL genome destabilization under the effect of bleomycin, which was evaluated by corresponding coefficients, has determined that increased sensitivity to bleomycin is observed in 54.2% of patients with EC (Iici > 1.0, at individual variations of Iici from 1.2 to 2.4) and hidden chromosome instability has been detected in 37.5% of cases (at Isci < 1.0, Iici > 1.0) (Table 2, Fig. 1). In contrast, only two women (20.0%) in control had increased sensitivity to bleomycin and one (10.0%) — hidden chromosome instability. One more parameter, which shows chromosome instability, is presence of multi-aberrant cells being determined by number of CA per 1 aberrant cell. Before bleomycin impact, metaphases with two or more CA were determined in PBL of 33.3% of patients with EC, and after incubation of PBL with bleomycin — in 100.0% of EC patients. Due to this, after bleomycin effect, in PBL of all patients with EC, number of CA increased as well as index of quantity of CA per 1 aberrant cell (at the mean up to 1.6) that was higher, than its values in control (1.2). Moreover, in PBL, after incubation with bleomycin, wide range of aberration forms has been observed — dicentric chromosomes, chromatid-chromatid exchanges arose (Fig. 2). When carrying out study, we paid attention to the pre­sence of “marker” chromosome in PBL of one patient (K., 61 years), with family history of cancer: brother — colorectal cancer, grandfather by mother’s side — prostate cancer. After incubation with bleomycin, at ana­lysis of 143 metaphases of this patient, large acrocentric “marker” chromosome, which was found with frequency 2.1 per 100 cells, has been detected. Though bleomycin is not referred to mutagens used for detection of chromosomal fragile sites (FS), but it is logically to suppose that after impact of this mutagen, CA occur, first of all, exactly in these parts of chromosomes. At karyotype analysis, which was carried out at G-staining of metaphase chromosomes, we have determined in PBL of healthy women one FS, which has been detected on chromosome 2p15, but in the list of FS in this part no FS was registered . At the same time, in PBL of two patients with EC, up before impact of bleomycin, nonrandom sites of chromosome da­mage (in one patient in part 2p23, in second — 12q24) have been determined. After incubation with bleomycin, in PBL of 40.0% of EC patients, increased fragility of chromosomes in certain sites, which by localization coincide with known FS of chromosomes 1, 2, 4, 5, 8, 12 and 17: 1p32 (FRA1B); 1p36 (FRA1A); 1q31 (FRA1K); 2p13 (FRA2B); 2q22–31 (FRA2F, FRA2G); 2qter (FRA2J); 4q31 (FRA4C); 5q13–15 (FRA5A, FRA5B); 5q31 (FRA5C); 8q24 (FRA8C, FRA8D, FRA8E); 12q13 (FRA12A) and 17р12-(FRA17A), has been determined . Moreover, identification of genes in FS of chromosomes according to the NGNC database, allowed us to determine that in these sites exactly or besides them, key genes of reparation and regulation of cellular cycle (1р3.2 — BLYM, MYCLI, TALI, JUN; 1q2.2–2.4 — SKI, 1q23-q31-TRKB, TRKC; 2q3.3-qter — INHA; 4q3.1 — IL15; 5q2.1- q2.2 — АРС, 5q2.1- q3.1 — СTNN1, etc.) are located. We should pay attention on determined damages of chromosome 12 in site 12p11-p13 — exactly in this part are located genes, which are connected with development (12p12.1 — KRAS2) and progression (12-q24.13 — C-MYC, 12p11-р14 — TFRβ, 12p13 — CDК2, CDК4) of EC [19–22]. Obtained results of cytogenetic analysis can be the evidence of nonrandom nature of localization of chromosomal damages in PBL of patients with EC. Obtained results in certain measure coincide with results of other researchers, who have noticed four regions in chromosomes in PBL of patients with EC, in which FS were mostly found (1q2.4–3.1; 2q2.4–3.1; 4q2.5–3.1; 5q2.3–3.2) . Results of calculation of spontaneous and induced specific damageability of chromosomes from diffe­rent karyotype groups in PBL of healthy women and EC patients are represented in Fig 3. Analysis of spontaneous frequency of CA in PBL of patients with EC has showed that the highest number of susceptible sites has been detected in chromosomes from groups E, C and A and in a smaller number — in groups B and D, and aberrations of chromosomes were not observed in groups F and G. In control, chromosomes of different groups have been damaged with almost equal frequency, except groups D and G, in which aberrations of chromosomes were not observed. After bleomycin impact, specific damageability of chromosome has increased both in PBL of healthy women and in patients with EC. This damageability was significantly (р < 0.05) higher in groups A, B, C, E and, at the same time, induced damages in chromosomes from group F occurred. In general, in PBL of healthy individuals, specific damageability of chromosome after incubation of them with bleomycin was significantly (р < 0.05) lower, than in patients with EC and damages have been mostly observed in chromosomes of groups A and B. At calculation of specific damageability of genome (Wgenome) of PBL, it has been determined that in patients with EC, spontaneous level of Wgenome has equaled 2•10–5, and after impact of bleomycin it has significantly (р < 0.05) increased in 4.5 times and has constituted 9•10–5. In PBL of healthy women, Wgenome has equaled 8•10–6, and after incubation with bleomycin, it has increased only up to 1.0•10–5 (Table 3). 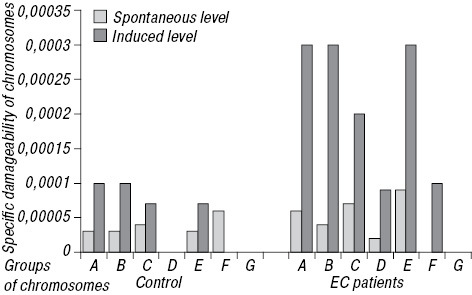 Note: *difference between indexes of EC patients and in control is significant (р < 0.05). Thus, results of cytogenetic study allowed us to detect series of differences between indexes of chromosome instability in PBL of healthy women and in patients with EC, main of which is high sensitivity of PBL of EC patients to mutagenic action of bleomycin. It should be mentioned that during carrying out of antitumor treatment (radio- and chemotherapy), detected high specific damageability of chromosome in patients with EC can cause progressive increase of genome destabilization and occurrence of secondary tumors. It can be assumed that hypersensitivity of chromosomes of PBL of patients with EC to the effect of bleomycin is not sporadic, but is conditioned by hereditary factors. This assumption can be confirmed by data of other authors, who have showed that sensitivity of PBL to the effect of mutagens is genetically determined. In particular, differences in sensitivity of chromosomes to bleomycin of PBL of mono- and dizygotic twins have been determined . Moreover, it has been demonstrated in series of studies that increased sensitivity of PBL to the effect of genotoxic agents is indicator of genetic predisposition of such individuals to cancer [7, 16, 24]. At the same time, it is known that at simultaneous impact of radioactive and chemical factors on organism (environment of the most populations in urbanized countries), they are able to perform both additive and multiplicative effect, and peculiarities of cumulative action of genetic and environmental factors is increase of multiplicative effect . Since exactly genetic mechanisms determine differences in people’s reactions to the impact of harmful factors, it can be assumed that presence of genetically determined genome instability is one of the key reasons of EC, which has been realized in the harmful conditions of environment. Thus, determination of spontaneous and bleomycin-induced level of CA in PBL helps us to detect individuals with high level of genome destabilization and high sensitivity to genotoxic environmental factors. It indicates the necessity of carrying out cytogenetic examination in EC patients, and, on the condition of hereditary nature of disease, also in their female relatives with the aim to detect individuals with high risk of cancer among them. Therefore, our findings indicate that PBL of most patients with EC are characterized by apparent genome destabilization, which has individual peculiarities and is manifested by increased number of spontaneous and induced damages of chromosomes, hypersensitivity to the impact of mutagenic factors and hidden chromosomal instability. Sites of high fragility, which were detected in chromosomes of PBL of EC patients, by their localization coincide with known FS of chromosomes, arrangement of some genes-suppressors, proto- and oncogenes, including genes involved in malignant transformation of endometrial cells, and with some sites of chromosomal damages, which are detected in tumor cells of endometrium. Cytogenetic study of PBL has clinical significance for detection of individual indicators being genetic markers of genome instability that must be taken into account while carrying out antitumor treatment of patients. 2. Peterson LM, Kipp BR, Halling KC, et al. Molecular characterization of endometrial cancer: a correlative study assessing microsatellite instability, MLH1 hypermethylation, DNA mismatch repair protein expression, and PTEN, PIK3CA, KRAS, and BRAF mutation analysis. Int J Gynecol Pathol 2012; 31: 195–205. 3. Nesina IP, Chekhun VF, Buchynska LG, Polishchuk LZ. Genome instability of endometrial and colorectal cancer patients. 3rd International Conference “Controversies in Tumour Prevention and Genetics” and 9th Annual Meeting of the International Society of Cancer Chemoprevention — ISCaC: Abstracts, Switzerland, St. Gallen, 12–14 February 2004. Eur J Cancer 2004; 2: 2P 0. P10. 4. Bochkov NP, Chebotarev AN, Katosova LD, Platonova VI. Database for analysis of quantitative parameters of frequency of chromosome aberrations in culture of human peripheral blood lymphocytes. Genetica 2001; 37: 549–57 (in Russian). 5. Tarasenko LV, Bezdrobna LK, Tsyganok TV, et al. Spontaneous levels of chromosome aberrations in citizens of Kyiv in long-term period after Chernobyl disaster. Tekhnogenna Bezpeka 2013; 198: 120–3 (in Ukrainian). 6. Kozovyi RV. Frequency and spectrum of chromosomal aberrations, associations of acrocentric chromosomes in long-living people of various ecologic regions of Ivano-Frankivsk oblast. Probl. stareniya i dolgoletiya 2013; 22: 121–8 (in Ukrainian). 7. Wu X, Gu J, Spits MB. Mutagen sensitivity: a genetic predisposition factor for cancer. Cancer Res 2007; 67: 3493–5. 8. Pilinska MA, Dybsky SS, Dybska OB, Pedan LR. Hidden chromosome instability detected at testing mutagenic impact of bleomycin in vitro in peripheral blood lymphocytes of control donors. Rep Nat Acad Sci of Ukraine 2008; (8): 184–8 (in Ukrainian). 9. Telnov VI. Genetic predisposition of people to radiation and chemical effects: analysis of own and literature data. Scient-pract journal “Cliniko-laboratornyi consilium” 2010; 33–34: 88–93 (in Russian). 10. Rajaee-Behbahani N, Schmezer P, Risch A, et al. Altered DNA repair capacity and bleomycin sensitivity as risk markers for non-small cell lung cancer. Int J Cancer 2001; 95: 86–91. 11. Pilinska MA, Dybsky SS, Dybska OB, Pedan LR. Radiation-induced modification of sensitivity of chromosomes of human somatic cells to the testing mutagenic impact of bleomycin in vitro. Tsytol Genet 2010; 44: 58–64 (in Ukrainian). 12. Demina EA, Ryabchenko NM, Druzhina MO, Chekhun VF. Cytogenetic method (G2-assay) of determination of individual human radiosensitivity aimed at primary prophylaxis of radiogenic cancer. Methodical recommendations. Kyiv, 2007. 28 p. (in Ukrainian). 13. Zerova-Lyubimova TE, Horovenko NH. Cytogenetic methods of study of human chromosomes: Methodical recommendations. Kyiv 2003. 24 p. (in Ukrainian). 14. Mykhailovska OV, Viktorova NA, Krasnova OR, et al. Study of chromosomal fragility in peripheral blood lymphocytes in patients with lymphomas. Tsytologiya 2005; 47: 83–8 (in Russian). 15. Zakharov AF, Benjush VA, Kuleshov NP, Baranovs­kaya LI. Human chromosomes (atlas) AMS of USSR. Moscow. Medicina 1982; 264 p. (in Russian). 16. Druzhinin VH, Larionov AV, Minina VI. Evaluation of individual radiosensitivity of human genome in the conditions of chronic impact of irradiation of radon and its decay products. Materials of International scientific-practical conference “Radioecology of XXI century”, May, 10–12, 2012, Krasnoyarsk, Russia: 393–400 (in Russian). 17. Buchynska L, Brieieva O, Glushchenko N, et al. DNA repair deficiency in peripheral blood lymphocytes of endometrial cancer patients with a family history of cancer. BMC Cancer 2014 (in press). 18. McAlpine PS, Shows TB, Boucheix C, et al. The 1991 catalog of mapped genes and the nomenclature committee. Cytogen Cell Genet 1991; 58: 5–102. 19. Levan R, Partheen K, Osterberg l, et al. Chromosomal alterations in 98 endometrioid adenocarcinomas analyzed with comparative genomic hybridization. Cytogenet Genome Res 2006; 115: 16–22. 20. Database HGNC — The HUGO Gene Nomenclature Committee Database (http://www.genenames.org/). 21. Pathak S, Berry R, Hopwood V, et al. Indentification of primary chromosomes-abnormalities in patient with endometrial carcinoma — analyses of tumor-biopsy and lymphocyte-cultures. Int J Oncol 1995; 7: 765–72. 22. Wang Y, Yang D, Cogdell D, et al. Genomic characterization of gene copy-namber aberrationions in endometrial carcinoma cell lines derived from endometrioid-type endometrial adenocarcinoma. Technol Cancer Res Treat 2010; 9: 179–89. 23. Zaporozhan VN, Rojkovskaya NN, Bobrova VN. Fra­gile sites of chromosomes as markers at neoplastic processes in uterus. Arhiv Clin Exp Med 2012; 21: 160–1 (in Russian). 24. Tedeschi B, Cicchetti R, Argentin G, et al. Aphidicolin and bleomycin induced chromosome damage as biomarker of mutagen sensitivity: a twin study. Mutat Res 2004; 546: 55–64.